I came home to our farm last night, too exhausted to cook dinner. Problem was, I was hungry. The thought of a salad, or anything cold and raw was completely off-putting. I needed warmth and nurture. Solution? A lovely bowl of warm pudding – healthy and delicious but creamy and sweet enough to feel like an indulgence. This easy-to-digest meal is gluten-free, dairy-free and vegan. Perfect for those with dietary restrictions, to tempt a fussy eater or for someone who’s unwell. 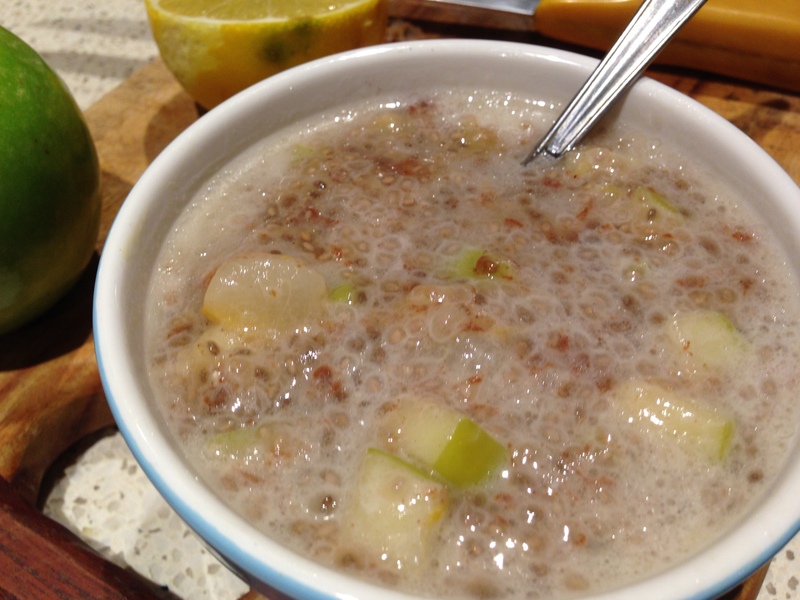 And the coolest thing about this recipe is that it makes an outstanding breakfast too! The apple and pear give sweetness and texture to this comforting pudding. 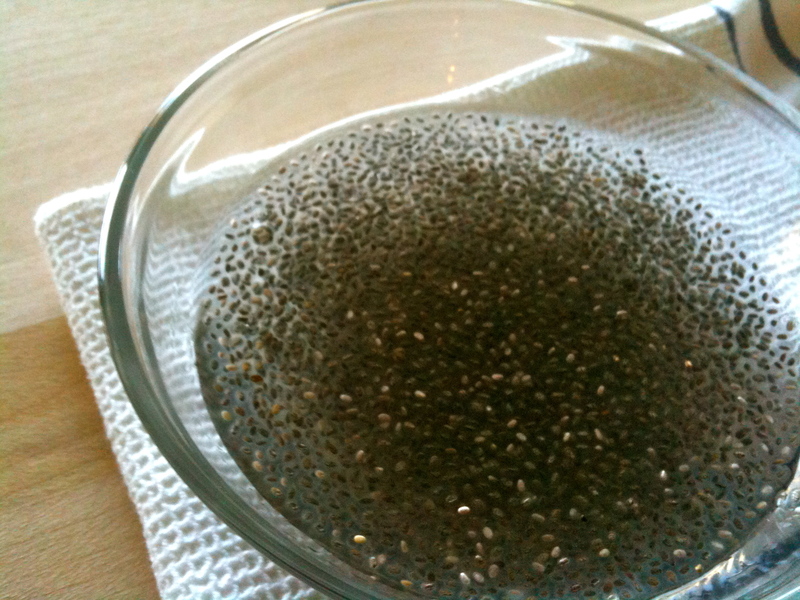 Chia seeds are often touted as a superfood. I have to agree. They are high protein, high fibre, gluten-free, packed full of omega 3 fatty acids, potassium, calcium, Vitamin C, iron and anti-oxidants, plus they help heal the digestive tract and stabilise blood sugar. Win! 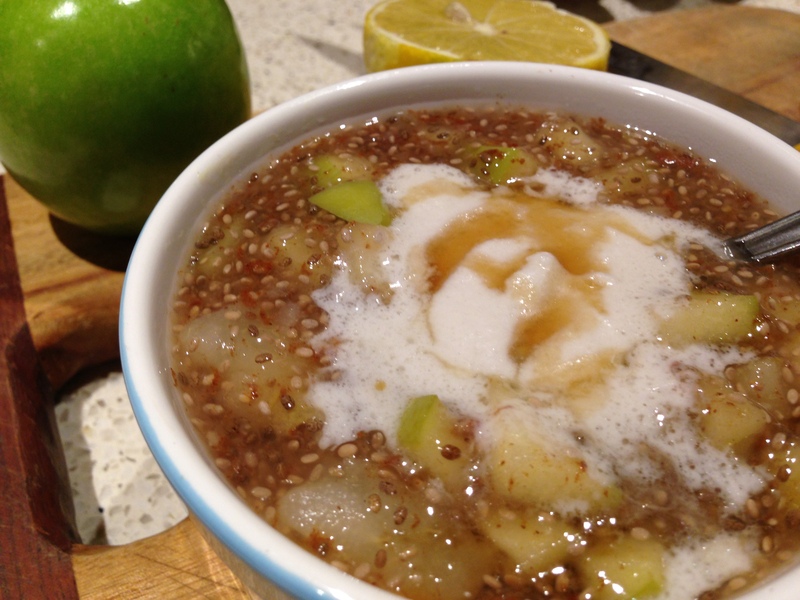 Two ripe pears; two apples; 2 tablespoons of water; 1 heaped teaspoon of cinnamon; zest of a lemon; juice of half a lemon; 2 teaspoons of natvia, honey, maple syrup or other sweetener of your choice; 2 heaped tablespoons of chia seeds; 1 and a half cups of water; coconut cream and a little extra maple syrup to serve. Note: It’s also fine to use four pears or four apples, depending on what’s in your pantry or on your list of available foods if you are working with dietary restrictions. Dice pears and apple. Add to a saucepan over medium heat with two tablespoons of water and the cinnamon, lemon zest and juice. Stir for a few minutes until the fruit softens. 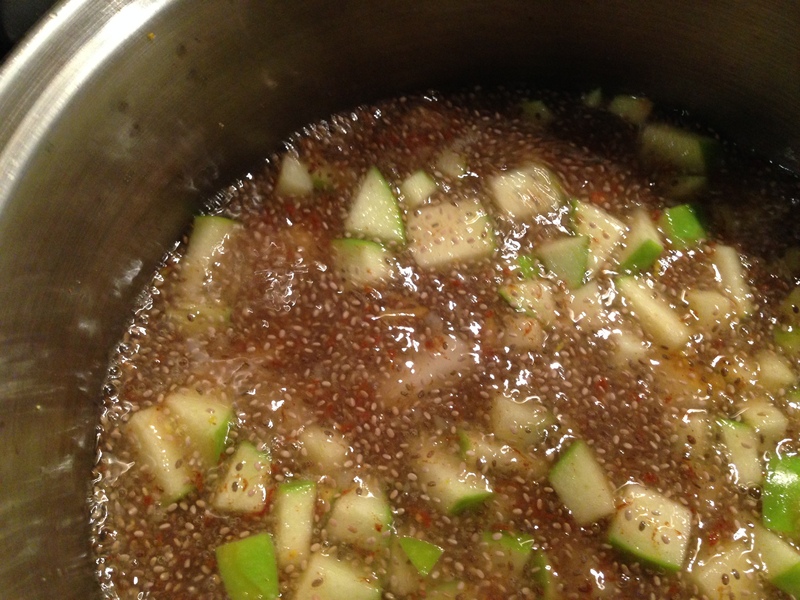 Now pour in the chia seed mixture, which will have a runny jelly-like consistency. 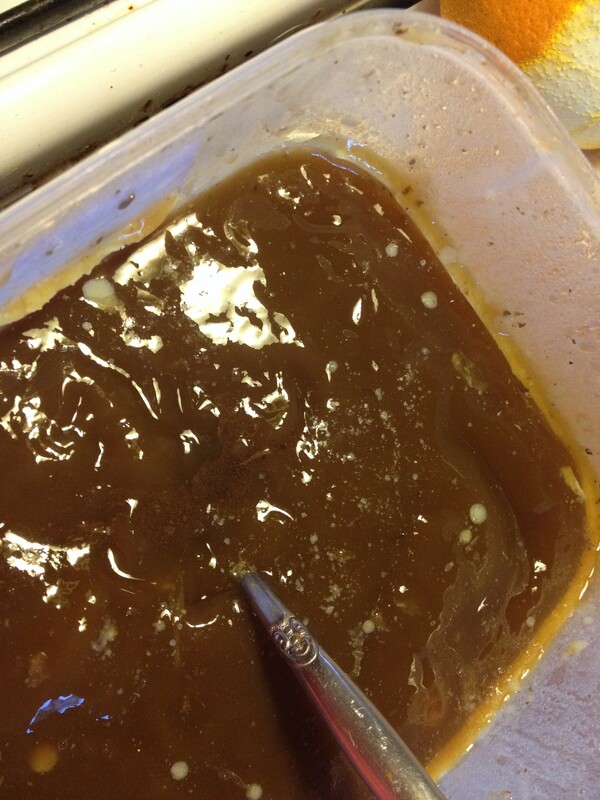 Stir well over medium heat until the mixture is thick and warm – about five minutes. Add a little sweetener to taste. 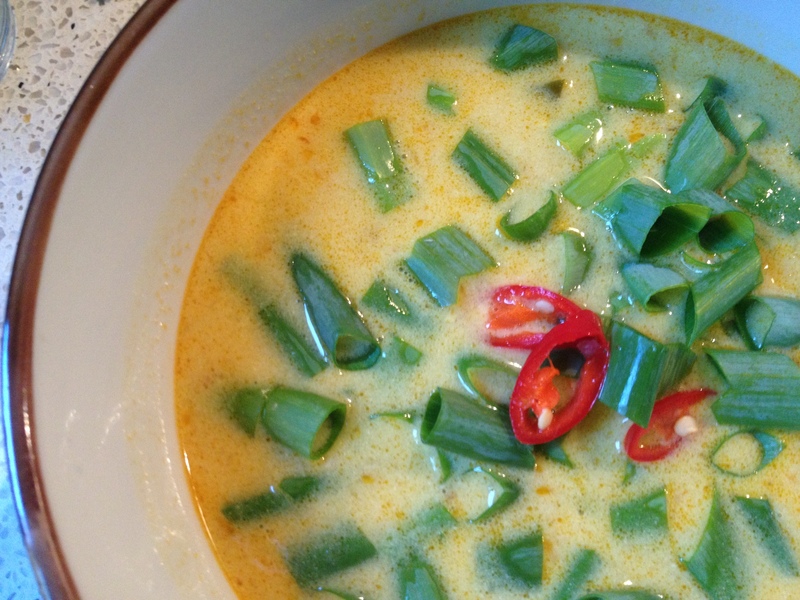 Spoon into serving bowls and add a generous dollop of coconut cream. Drizzle a little maple syrup over the top. 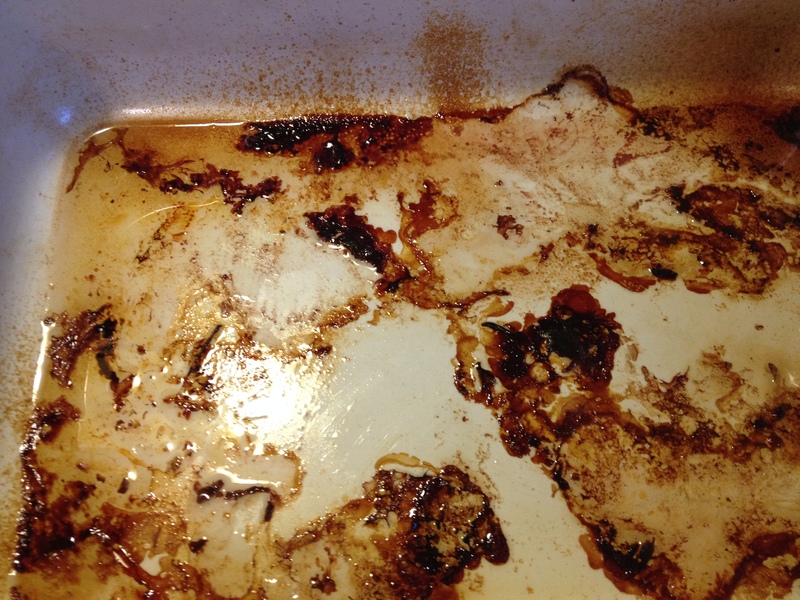 Any leftovers can be stored in fridge for up to three days. Try spooning the mixture into glasses, layering with a little yogurt or coconut cream to enjoy cold tomorrow as a breakfast parfait. The pudding also reheats well. Just use gentle heat and add the coconut cream in before you heat it! If you have eggs and bread you’re set. This meal works for breakfast, lunch, dinner or as a snack! When I finally arrived home at my farm last night and found an almost bare cupboard, this was a perfect simple dinner with a glass of freshly squeezed orange juice from the fruit in our orchard. I’ve loved soft boiled eggs and dippy toast soldiers since I was a little girl and my Nana would make them for me when I went for sleep-overs at her house. If it was cold I always got to wear her dressing gown too. Cosy, warm and loved – that’s how this old-fashioned recipe makes me feel, just like Nana’s gown. 2 to 3 fresh eggs per person, one slice of bread per egg, and some butter, salt and pepper. Egg cups to serve. Set a saucepan of water on the stove to boil. Add a liberal pinch of salt. This helps to prevent the egg shells from cracking. 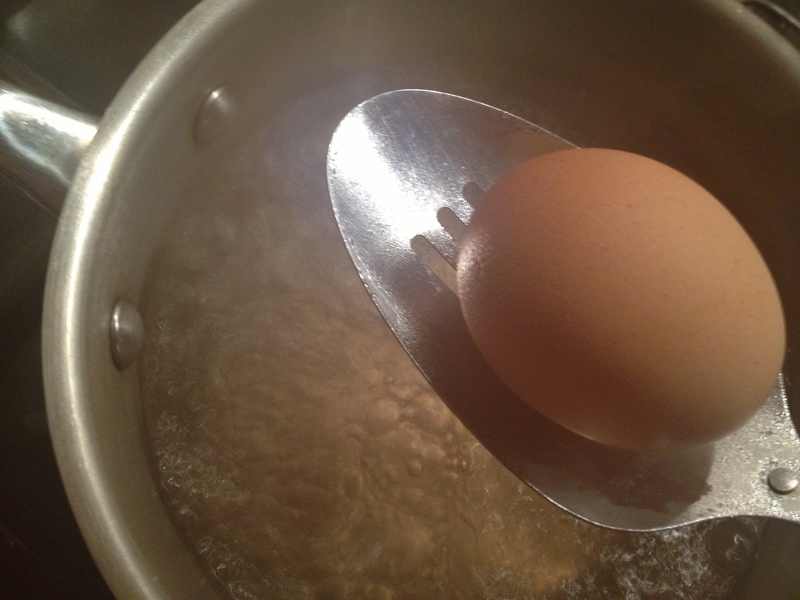 When the water is boiling rapidly use a slotted spoon and gently lower each egg into the water, releasing it slowly so it doesn’t bang on the bottom of the pot and crack. When all the eggs are in your pot set a timer for three minutes. *Note on timing: my husband likes his eggs REALLY runny so I cook his for three minutes. The white will still be a little wobbly too and you’ll be able to scoop the entire egg out with your toast! 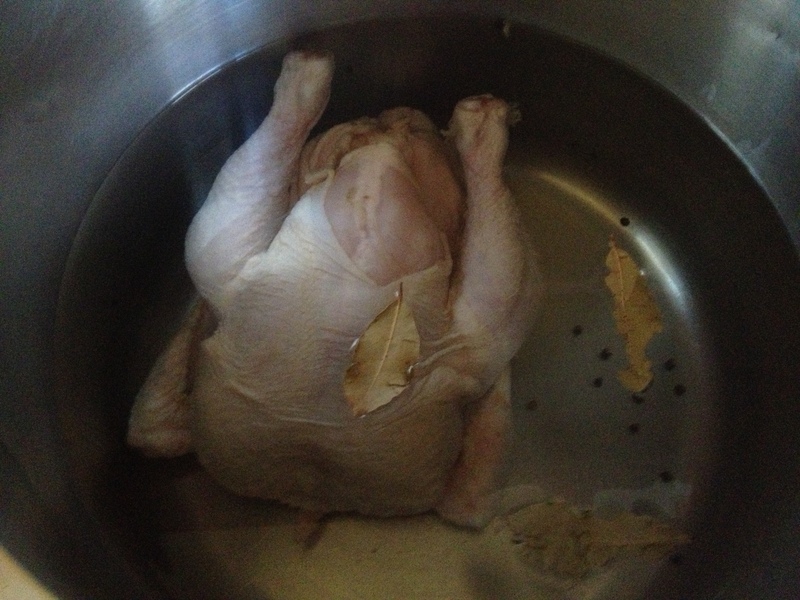 I leave mine in the pot for another 30 seconds to a minute after I have taken it off the heat. This sets the white but the yolk will still have a runny centre. The picture at the top of the page is my egg (four minutes – you can see the yolk is starting to firm around the edges) and the picture below is Ben’s three minute egg – gloriously runny. Once you get to five minutes your yolks will be quite firm and will still be delicious but you won’t be able to dip your toast in. 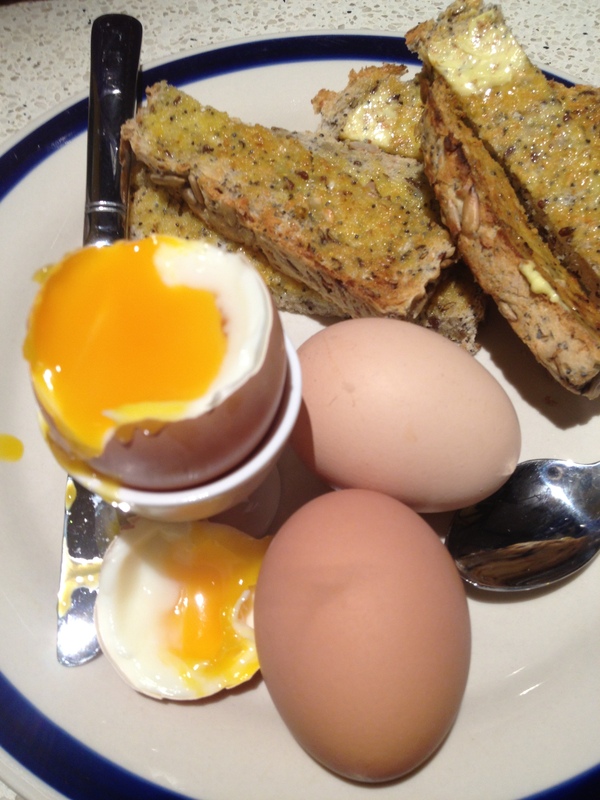 To serve place an egg in the egg cup and the spare egg beside it, and then add a pile of toast. Use your knife to tap the side of the egg and then chop the top off, revealing the gooey yolk. 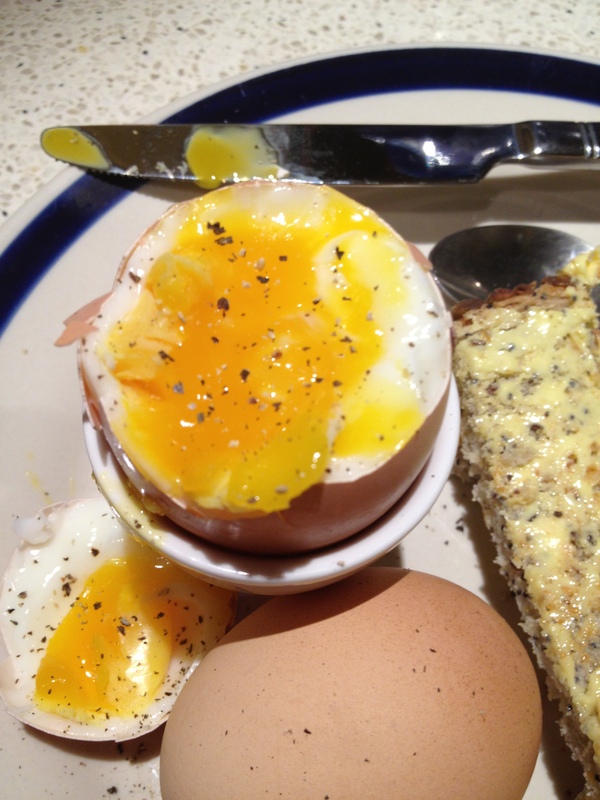 Add a grind of salt or pepper if you wish, and then take a toast ‘soldier’ and dip it into your velvety, runny egg. Food isn’t just food. Food is also a healing tool. A spiritual tool. A way to give love and care to self and others. This is a handy recipe – it works well for a vegan or vegetarian main course, or as a tasty side to accompany fish, chicken or meat. It is equally good served cold as a salad, and is delicious when folded into the centre of an omelette. 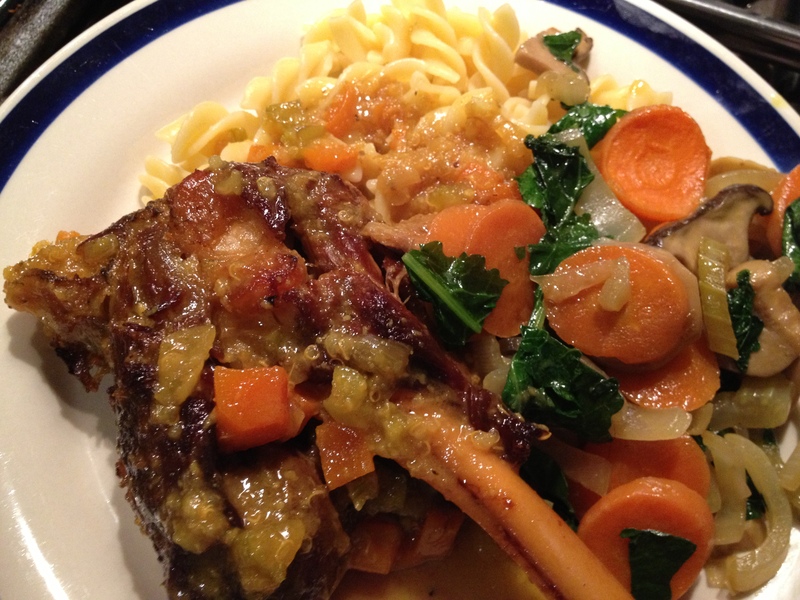 The dish is also paleo compliant, as well as being dairy and gluten free. Needless to say, I recommend you make up enough to enjoy some leftovers! If you want to think of it as more than just food, this simple recipe provides instant grounding for those times when you feel frazzled, disconnected, stressed and not quite in your body. It works to soothe, nourish and centre your Solar Plexus, Heart and Crown Chakras. It’s anti-inflammatory, and nurturing for those of us with exhaustion issues and adrenal fatigue. *Note – leave the mushrooms in thicker slices or chunks for a more satisfying texture. 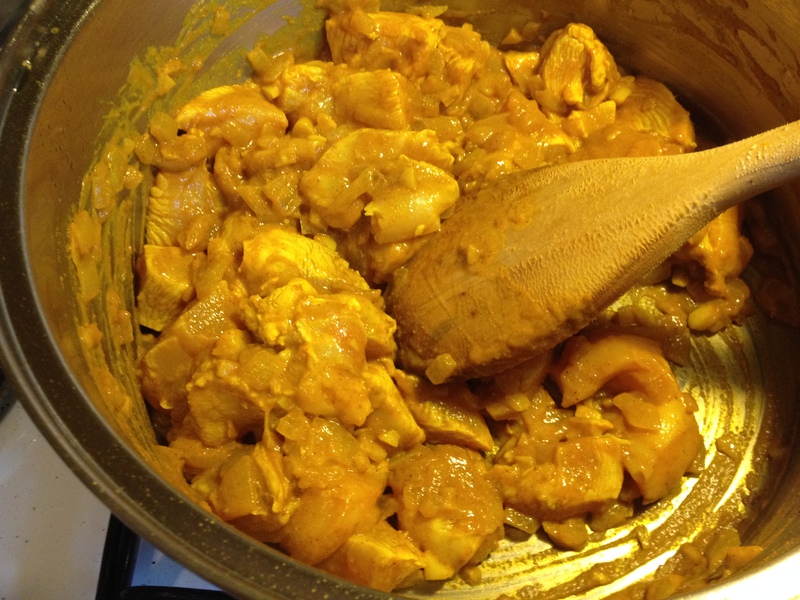 Place 1/4 of the water and the coconut oil in a large heavy-bottomed frypan or pot over medium heat. 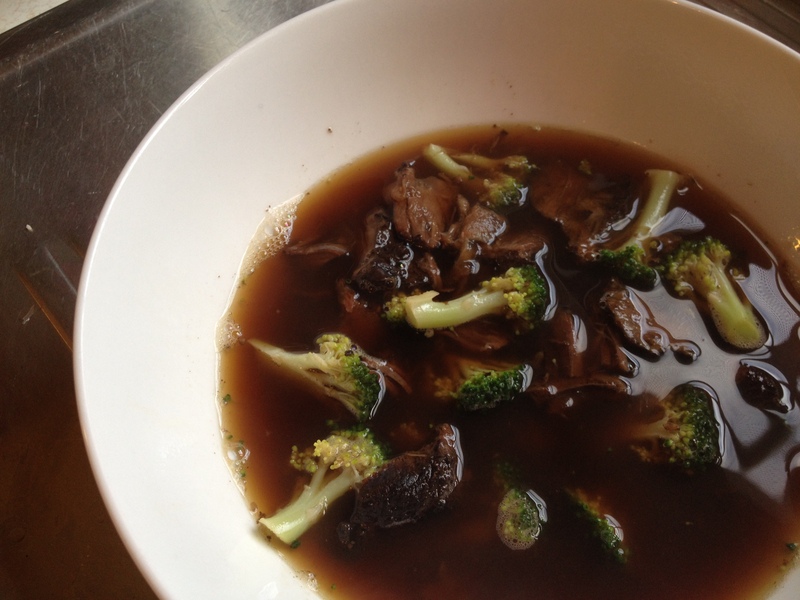 Toss in your sliced mushrooms, stir well and leave to cook for a minute until they begin to soften slightly. 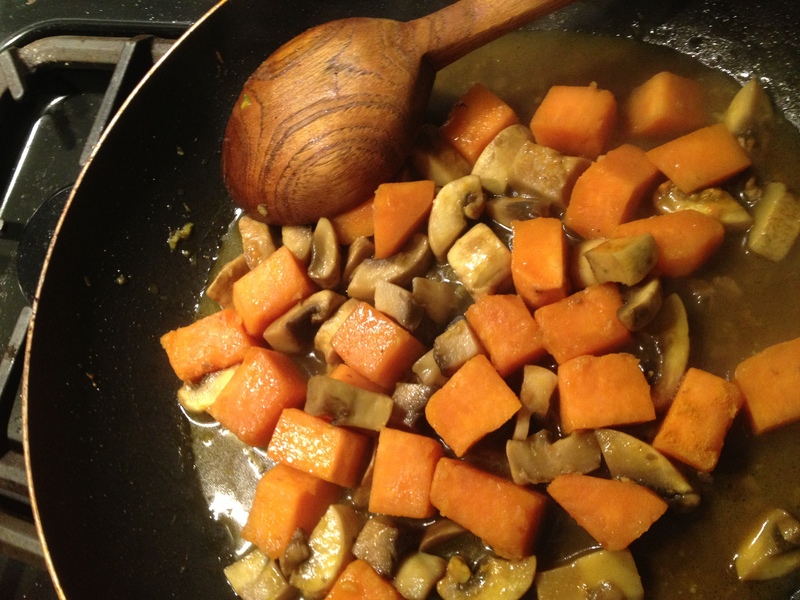 Then add your cubed sweet potato and another 1/4 cup of water. Stir to combine, lower heat and cook five minutes until sweet potato is becoming soft. 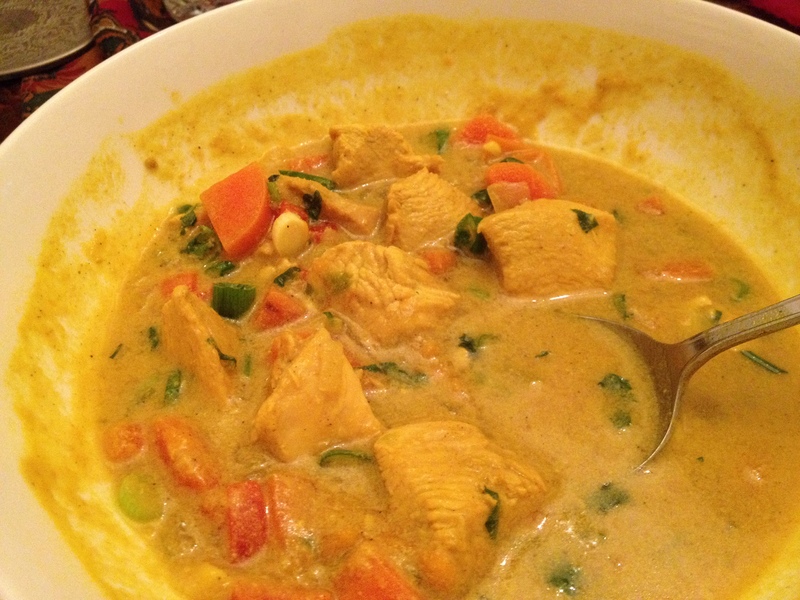 Increase heat again, add in the garlic, tumeric and tamari and stir well. Then dump in the broccoli and another 1/4 cup of water. 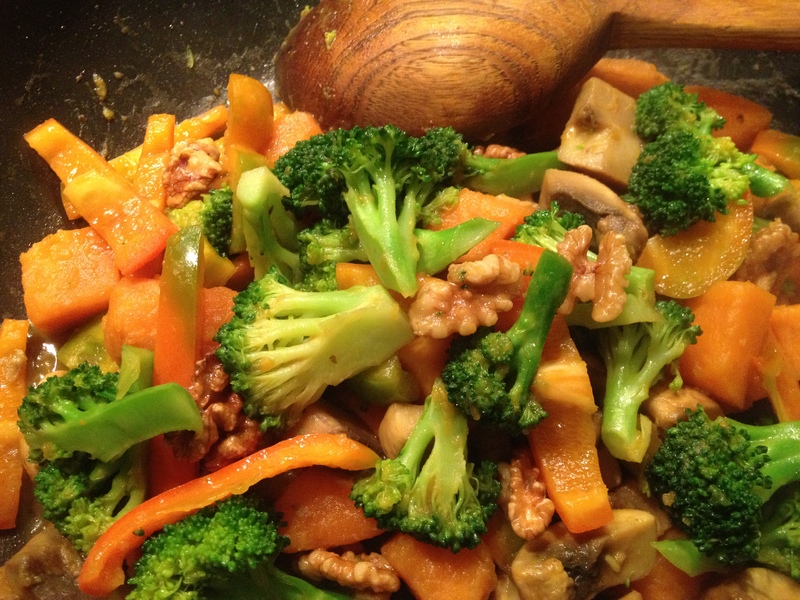 Stir fry for one minute, and then add the sliced capsicum. Continue to cook over high heat, stirring frequently and adding the final 1/4 cup of water if required. 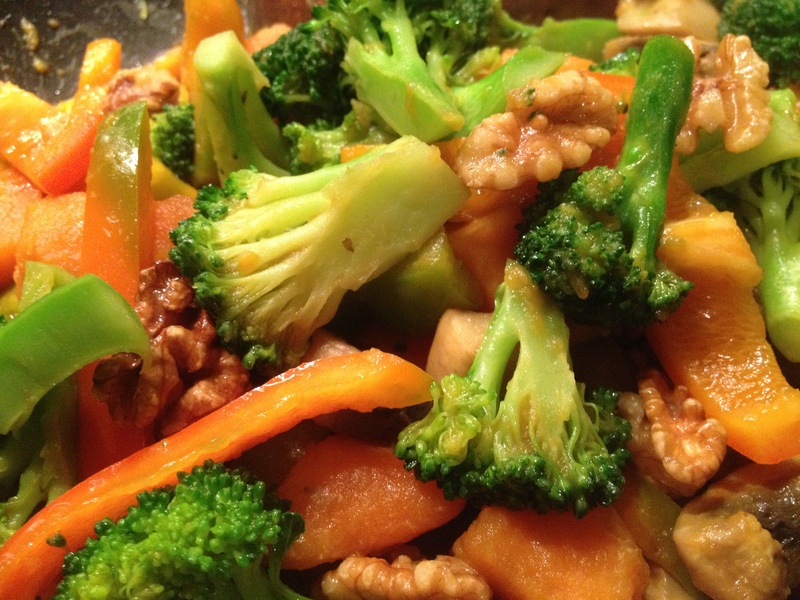 Add the walnuts, stir through, and remove from heat. 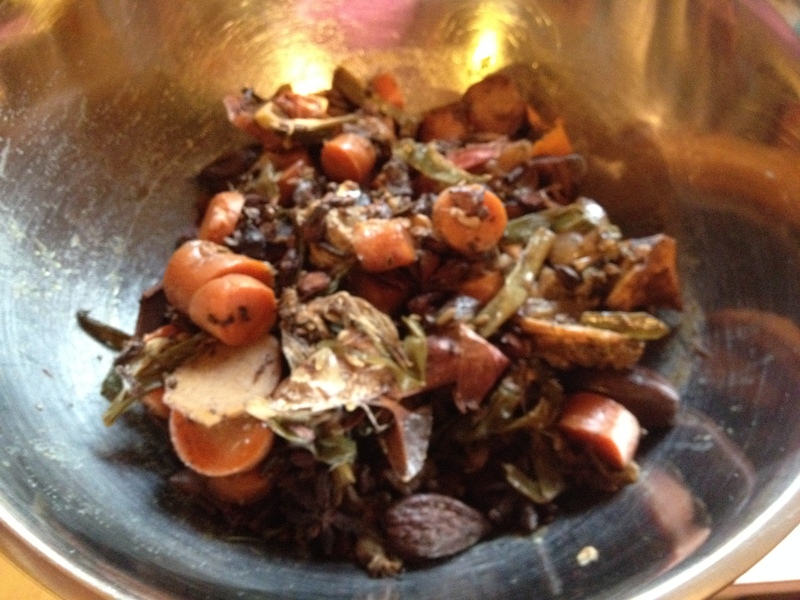 Your easy meal is now ready to enjoy, and is packed full of good things to help you nourish and heal yourself. 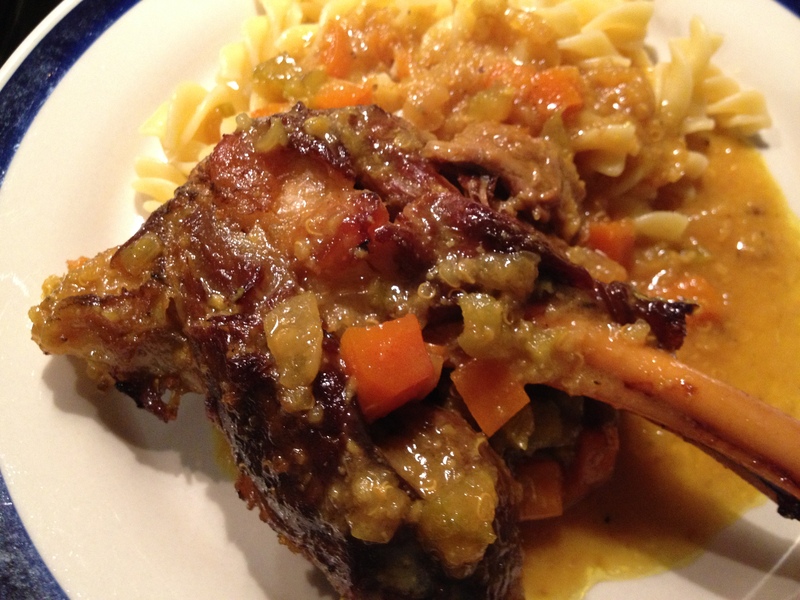 The flavours are simple and clean, and the food is easy to digest. Great for those with chronic fatigue, and for anyone recovering from illness. It grounds us, energetically soothes us and helps us to sleep better. But if you don’t tell people any of that, they’ll just eat it ‘cos it tastes good! Still, I digress. Today it’s all about soup. Soup is my go-to when I’m feeling poorly. Easy to make, easy to eat, and you get leftovers, which keep you going when you’re in that place of needing to eat and having no energy for cooking. 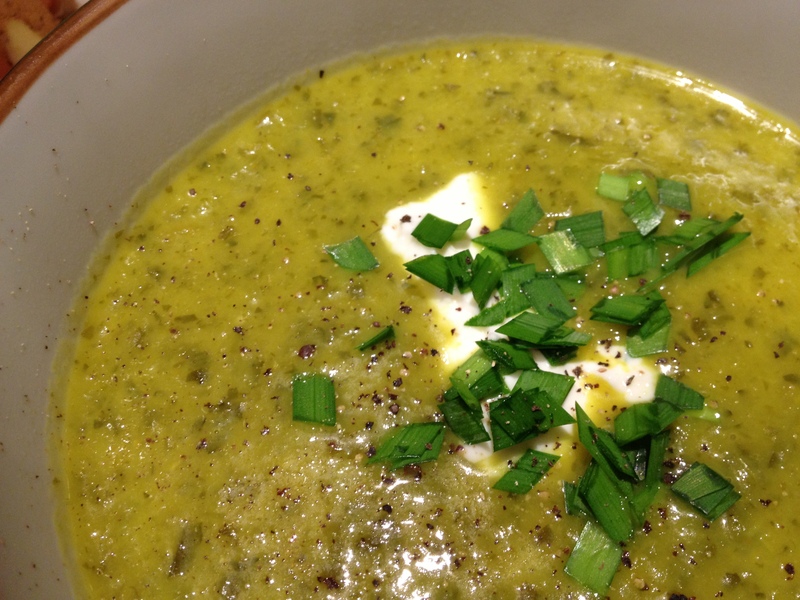 This is my current twist on that good old standard, Cream of Celery Soup. 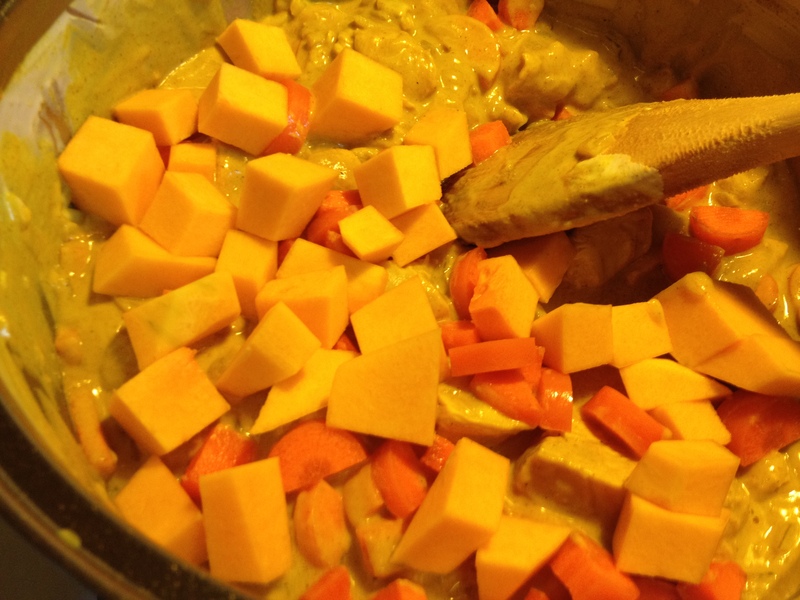 I’ve tweaked the recipe slightly to get some extra good stuff in there, namely coconut oil and tumeric. 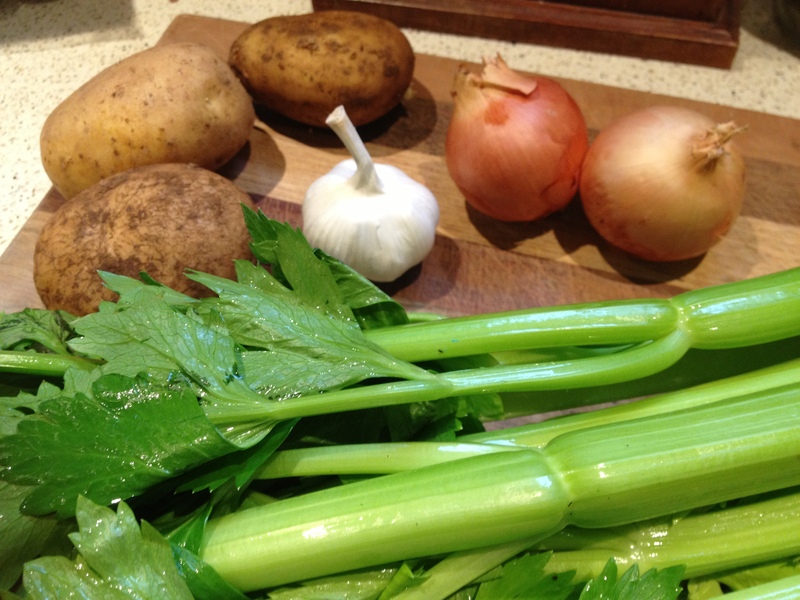 These two simple ingredients lift the humble celery soup into a powerhouse of anti-inflammatory and anti-bacterial goodness – perfect for warding off colds and flu bugs, and for boosting your energy and immune system. And it’s super for Lyme sufferers to help kick those borrelia bacteria suckers to the kerb! 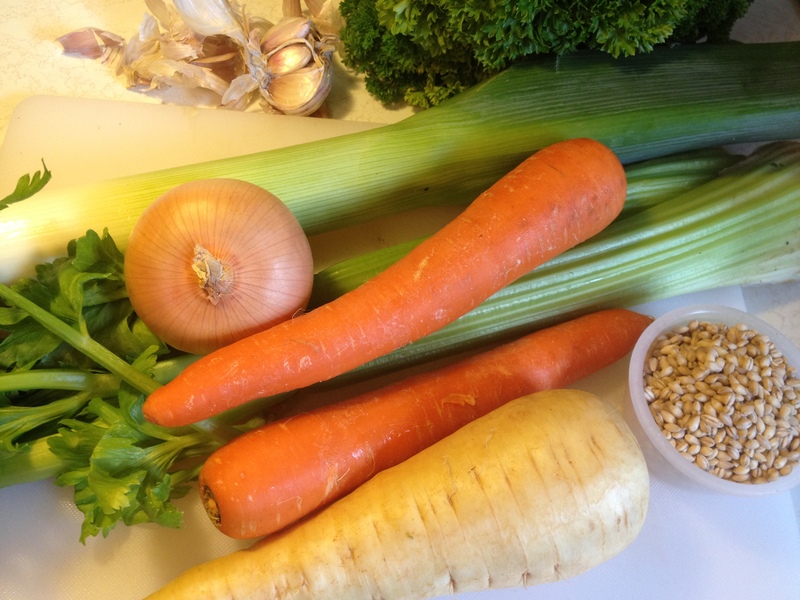 1 large bunch of celery, 4 cloves of garlic, one large or two small brown onions, 2 to 3 potatoes, 6 cups of chicken stock or vegan friendly vegetable stock, 1 tablespoon of tumeric, 1 tablespoon of coconut oil and one tablespoon of butter or ghee (vegans just use extra coconut oil! 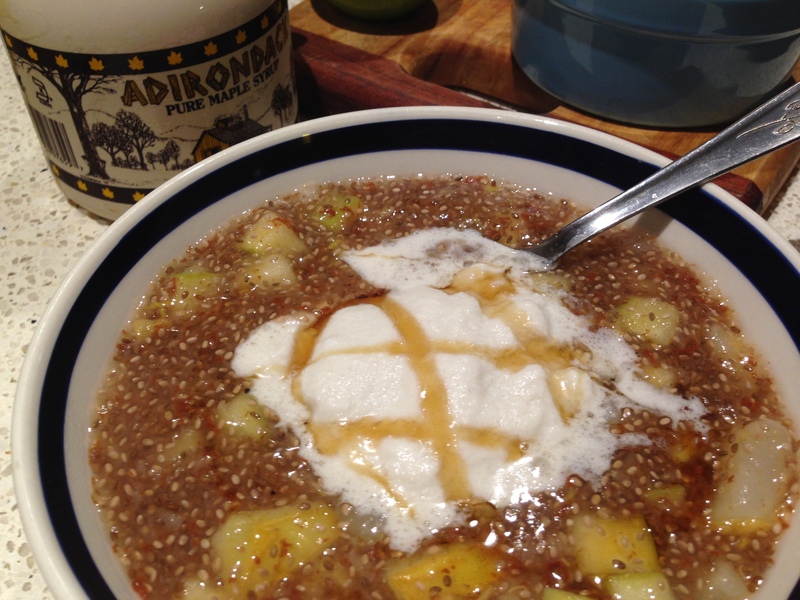 ), 3/4 cup of milk, cream or soy milk (your vegan option). To serve: plain yogurt (vegans – try coconut yogurt for a heavenly flavour combo! 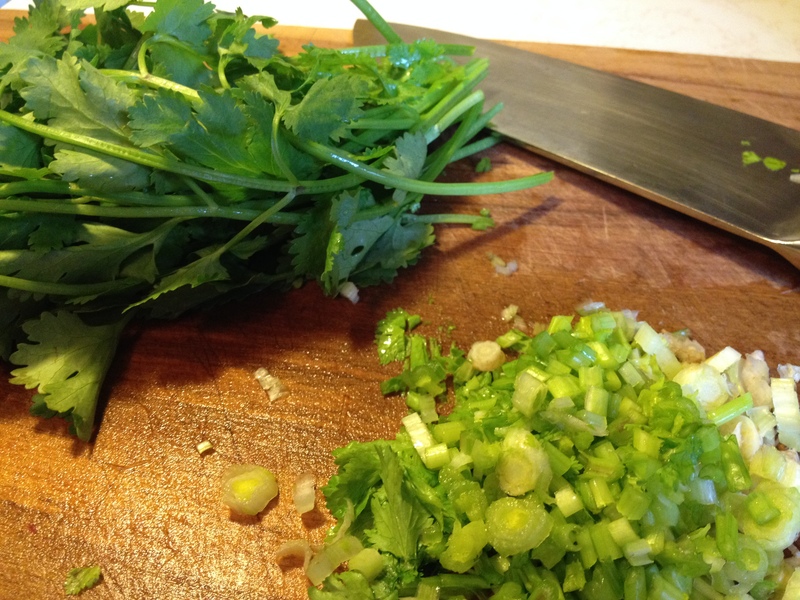 ), cracked black pepper, chopped fresh herbs such as garlic chives, parsley, or coriander (cilantro). 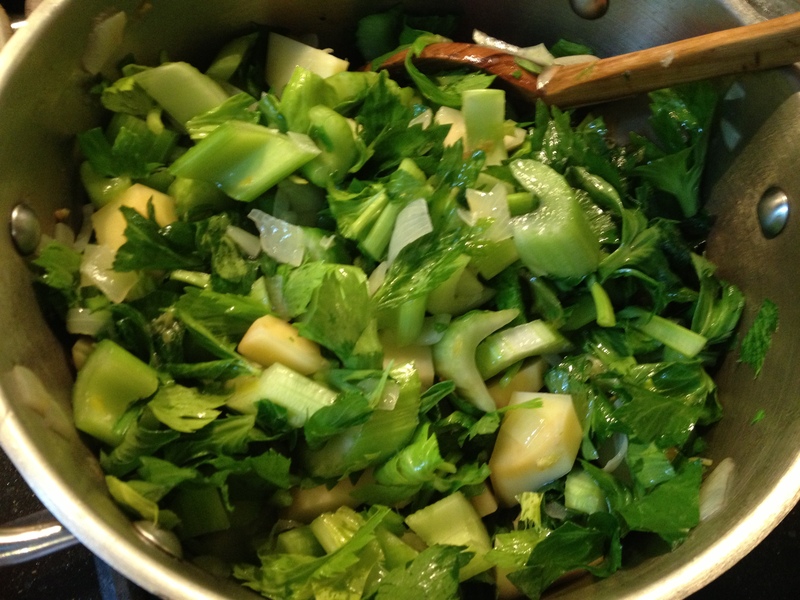 Cut the base from the celery and wash the stalks well. Remove any bruised or damaged leaves. 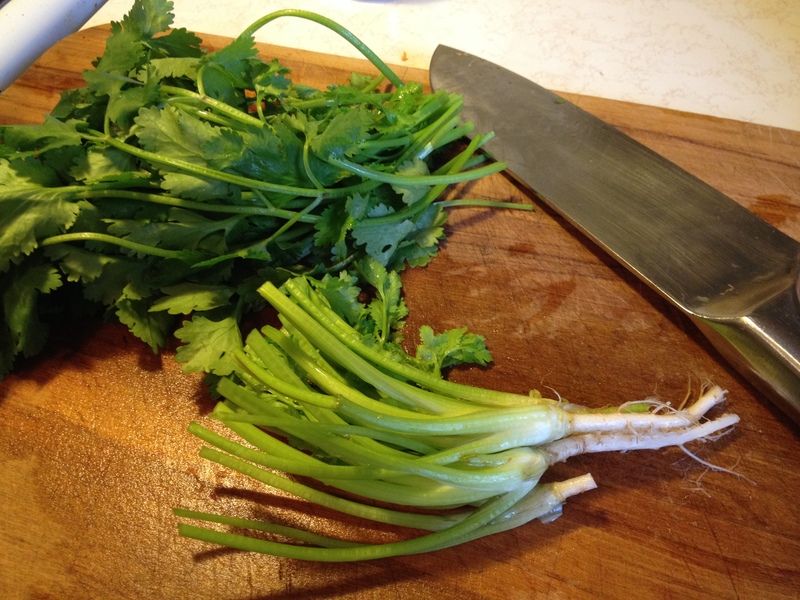 Then cut the celery stalks, leaves and heart into small pieces. Peel the potatoes and chop into small segments. Chop your garlic and onion, and add them to the base of a very large saucepan with the coconut oil and ghee. 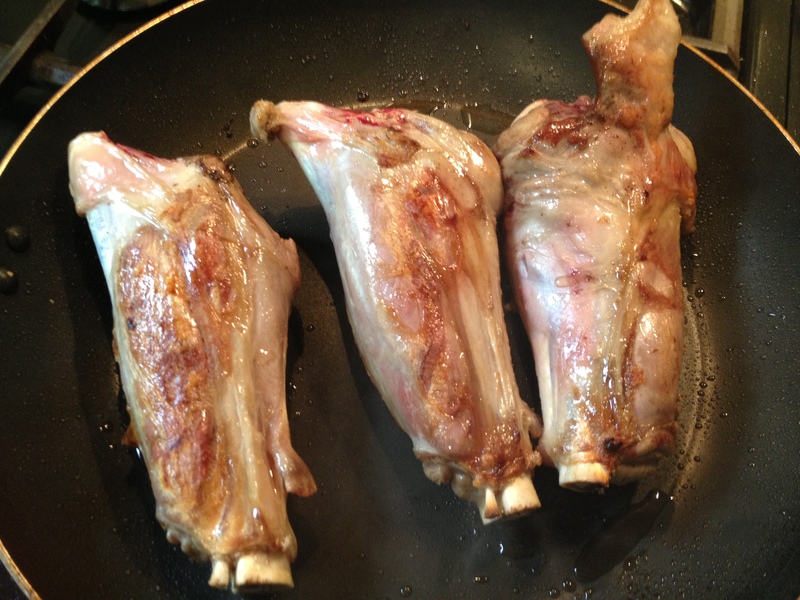 Cook over a low heat for a few minutes until they are softened but not coloured. 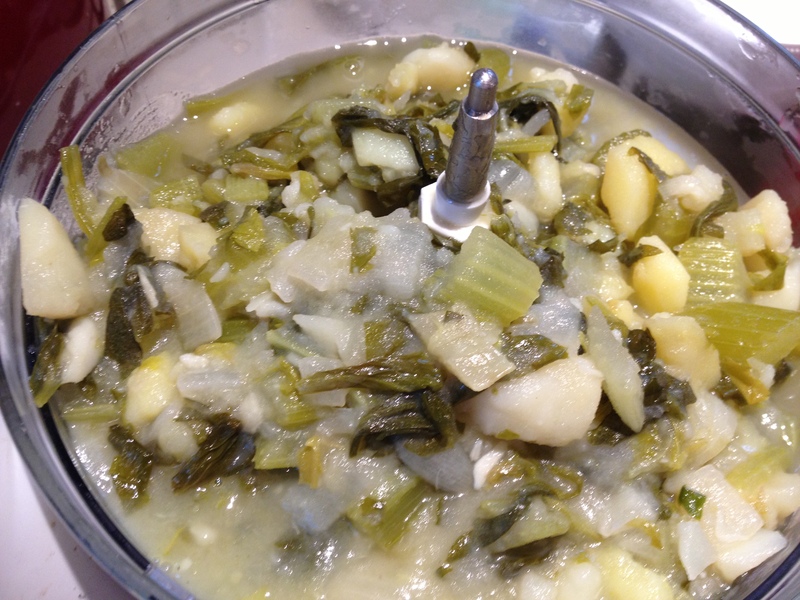 Now add in the potato, stirring to coat well with the oil, and then add the celery. Cook the vegetables over medium heat for five to ten minutes until they begin to soften, stirring every so often so they don’t catch on the bottom. 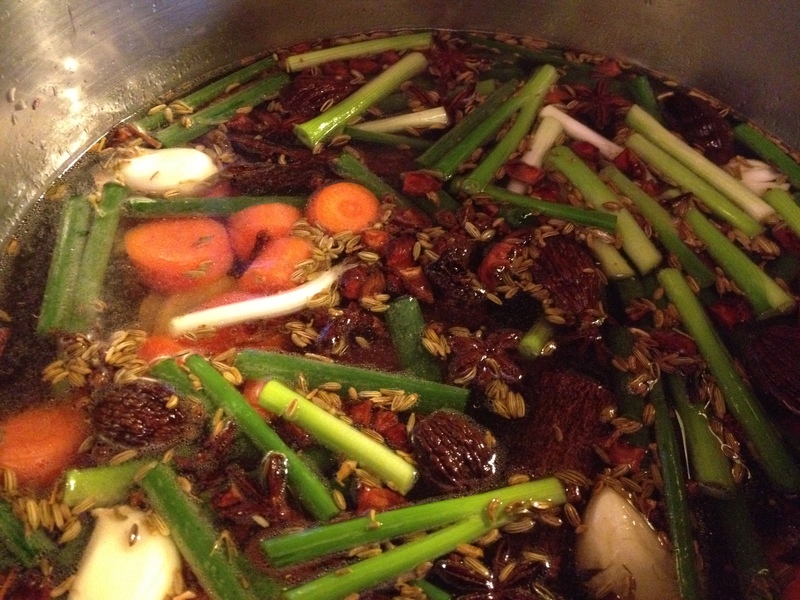 Pour in your stock, bring to the boil and then reduce heat to a simmer and cook for twenty minutes. Cool and then use a stick blender or a food processor to blend until smooth or to your liking. Return soup to pot. At this point, taste your soup. 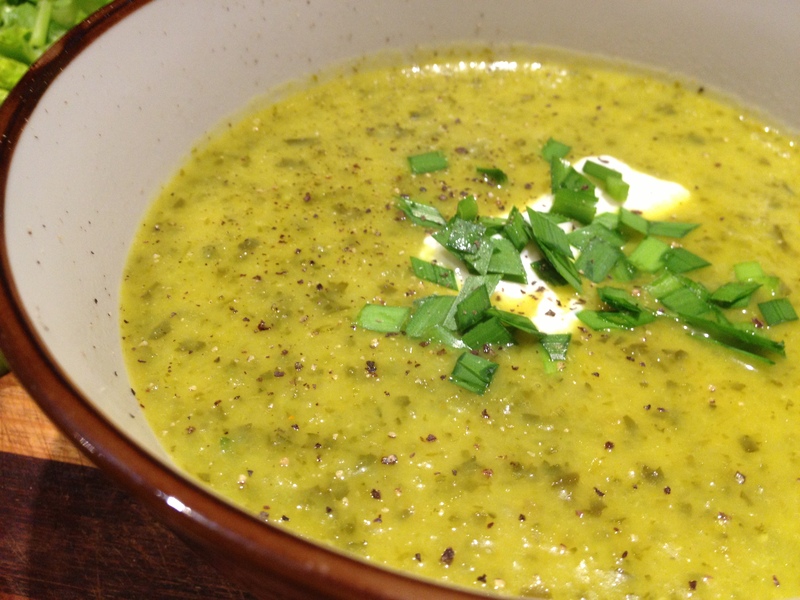 If you’re looking for a more traditional Cream of Celery Soup then omit the tumeric. 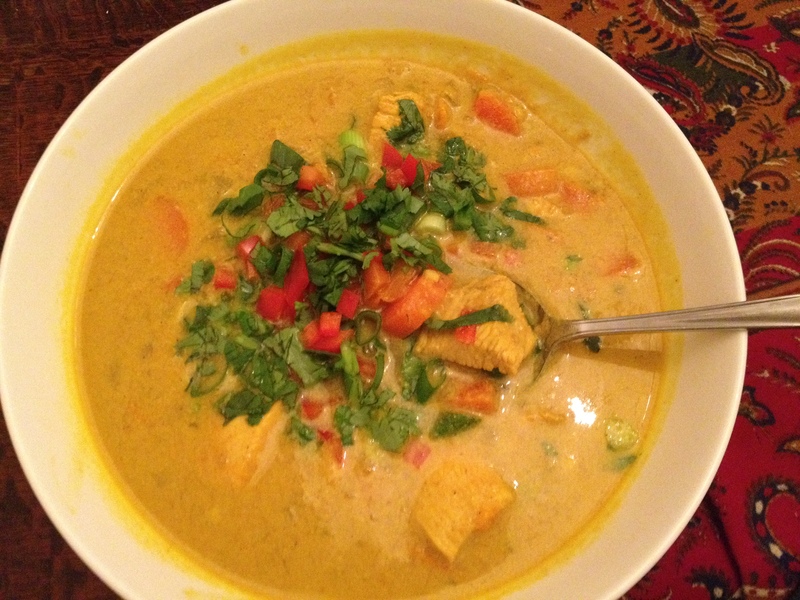 If you’re looking for extra complexity of flavour and a health kick, add in the tumeric, stirring well, and gently reheat. Add the milk or cream and adjust seasoning. 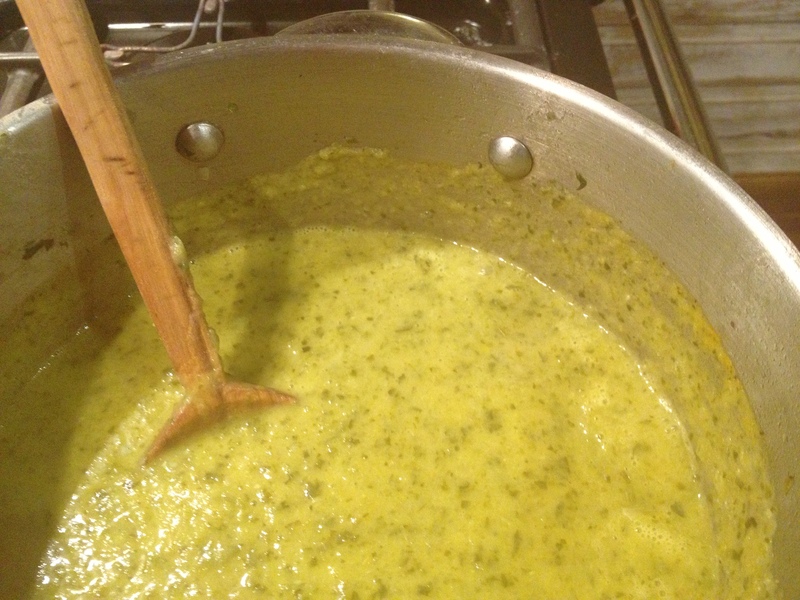 To serve, ladle into bowls, add a spoonful of yogurt, a sprinkle of fresh herbs and a dusting of cracked pepper. Can be enjoyed on its own, or with a good bread. This soup is filling, warming and nourishing without being too heavy. 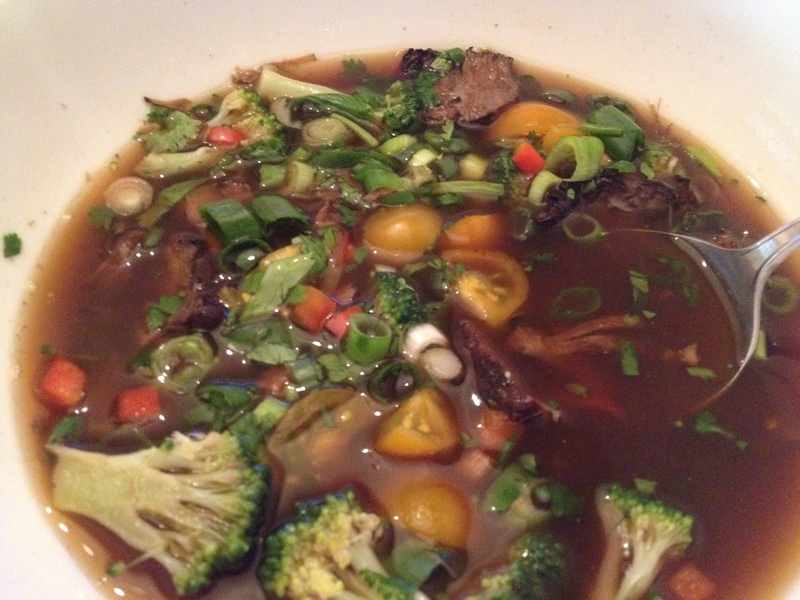 It’s medicine in a bowl, and I can attest to it tasting good as it does you good. Enjoy! Soup. I have such a fondness for it. 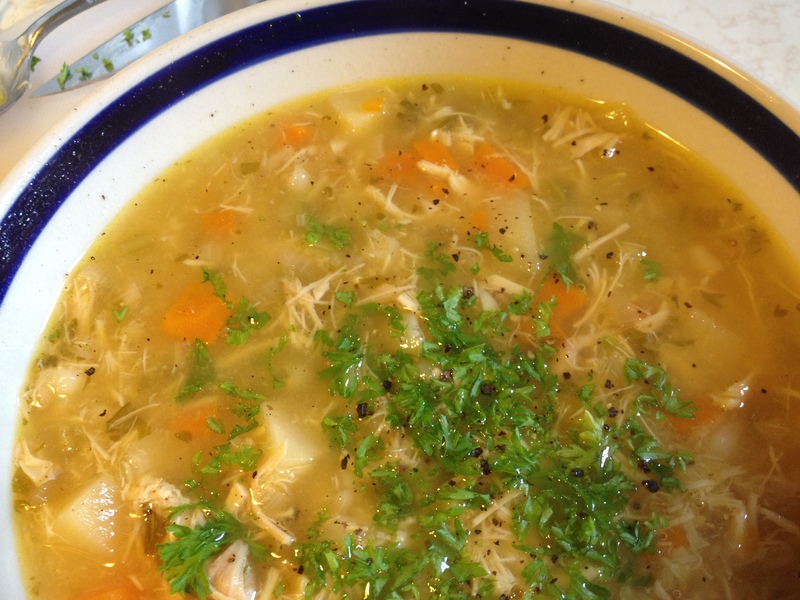 Slow cooked wonders like my Heal-All Chicken Soup, or speedy delights such as Quick Prawn and Miso Soup. 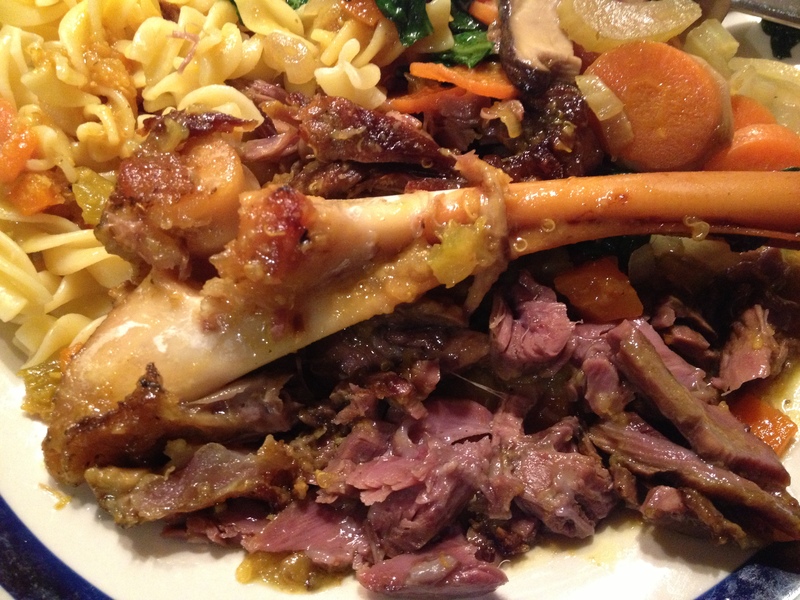 Today’s offering uses leftovers (hooray!) and will take you around an hour and a half, but only about ten minutes of that is prep time. I like to put my stock on the stove, and then go outside and hose the garden, take the washing off the line and other end-of-day jobs. By the time I’m finished the soup base is done and there’s not much left to do to turn it into a meal. 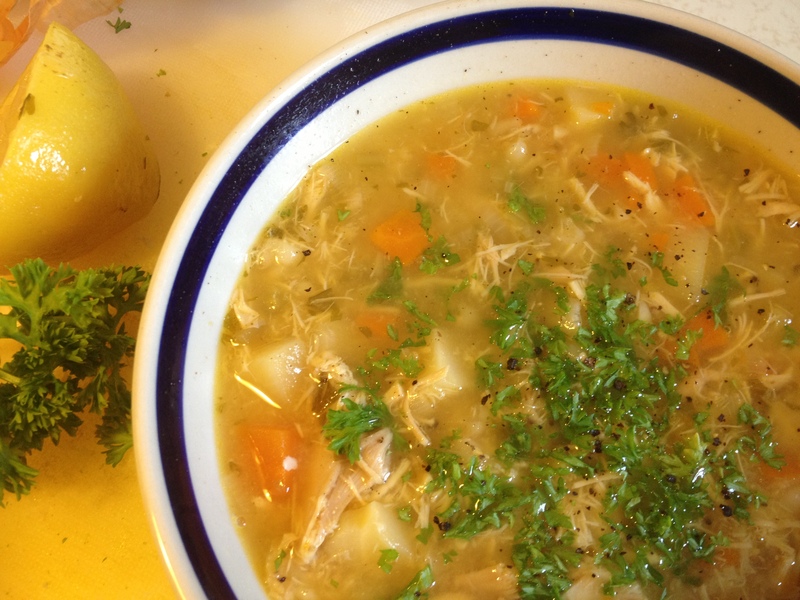 This is also a great easy soup to make if you’re not feeling well. It doesn’t take much effort, and it’s very good for you! It will keep well in the fridge for a few days, and freezes beautifully. 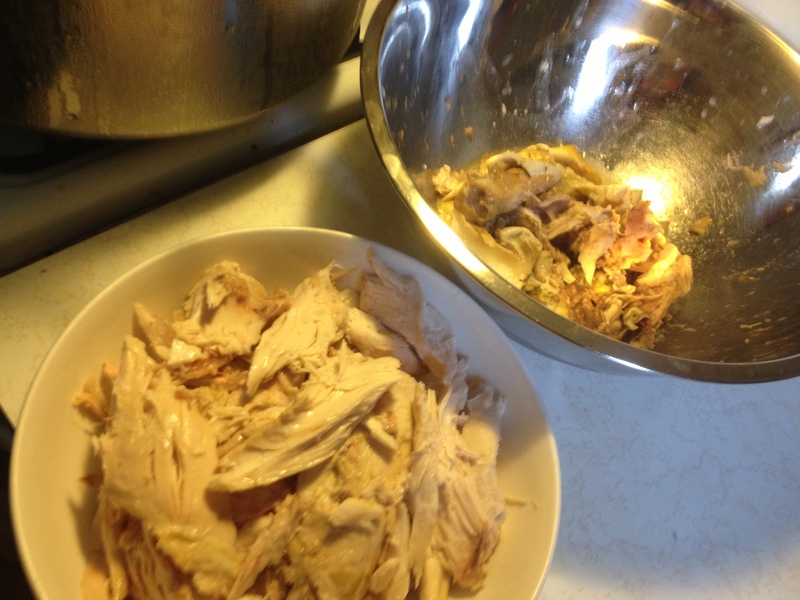 Stock Ingredients: Carcass from a roast chicken chopped into quarters or roughly broken apart (Note: please don’t use any stuffing – if your roast still has some in the cavity pull it out and discard! 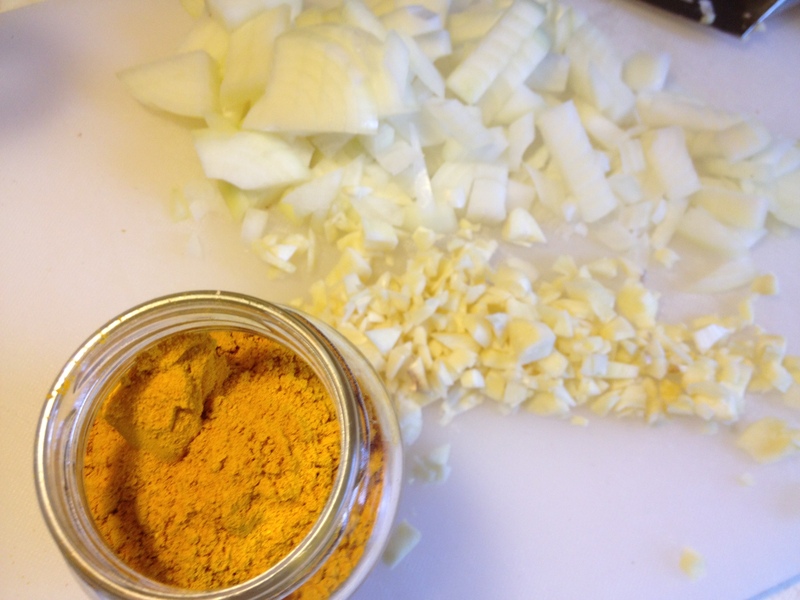 ), a tablespoon of apple cider vinegar, two bay leaves, one leek chopped into large rings, 2 inch knob of ginger – sliced, a 2 inch piece of fresh tumeric root – sliced (if you can’t get fresh root use 1 to 2 teaspoons of powered tumeric), 1 lemon quartered, and optionally an inch of fresh galangal – sliced, if you can get some, plus salt and pepper. 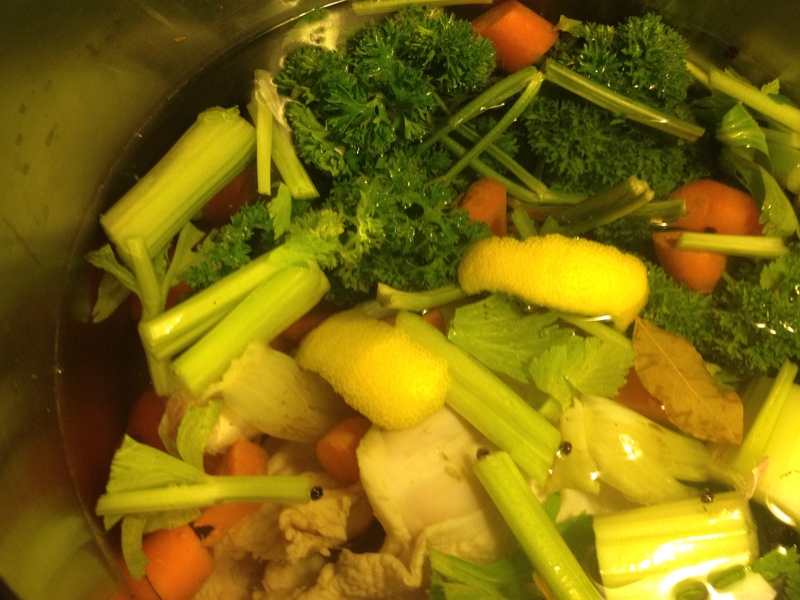 Method: Place all ingredients in a large stock pot and barely cover with water. 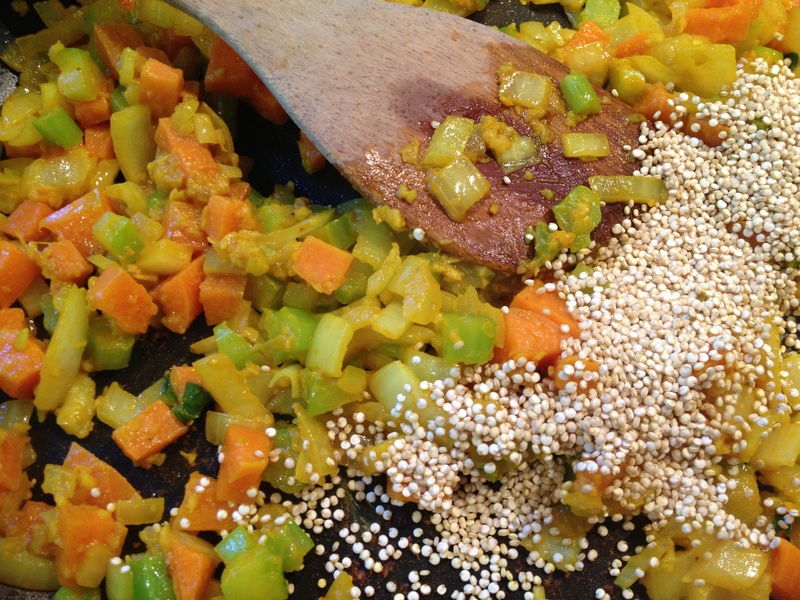 Add a small amount of salt (don’t go too crazy – you can always adjust the seasoning later) and a good grind of pepper. The apple cider vinegar helps draw the calcium and other good minerals out of the bones, making a fast and healthy bone broth. 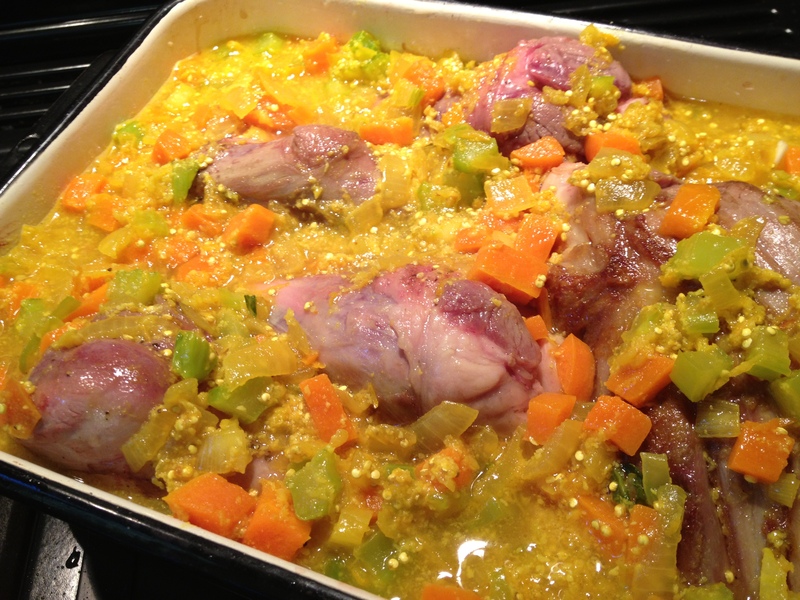 Bring to boil and then reduce to simmer, cover and cook for one hour. Cool for ten minutes, while you do the preparation for part two. 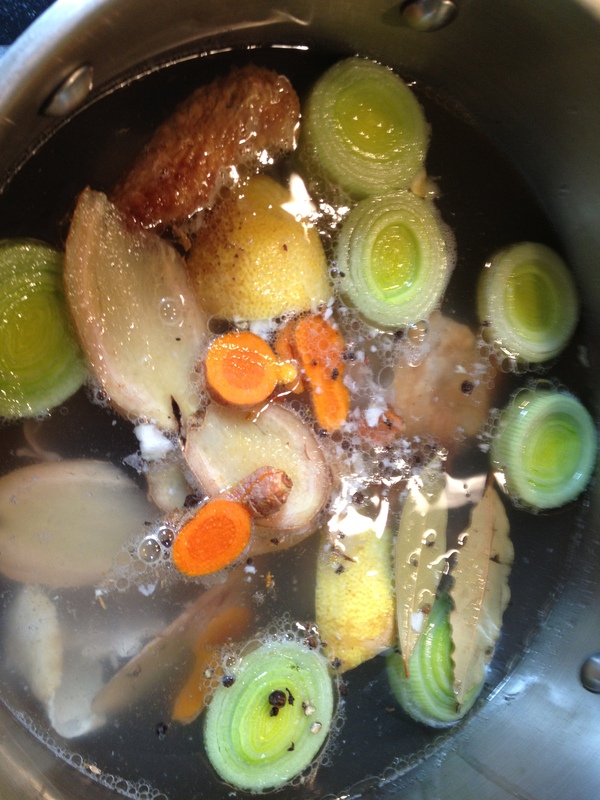 Then strain out the solids, keeping just the stock itself. 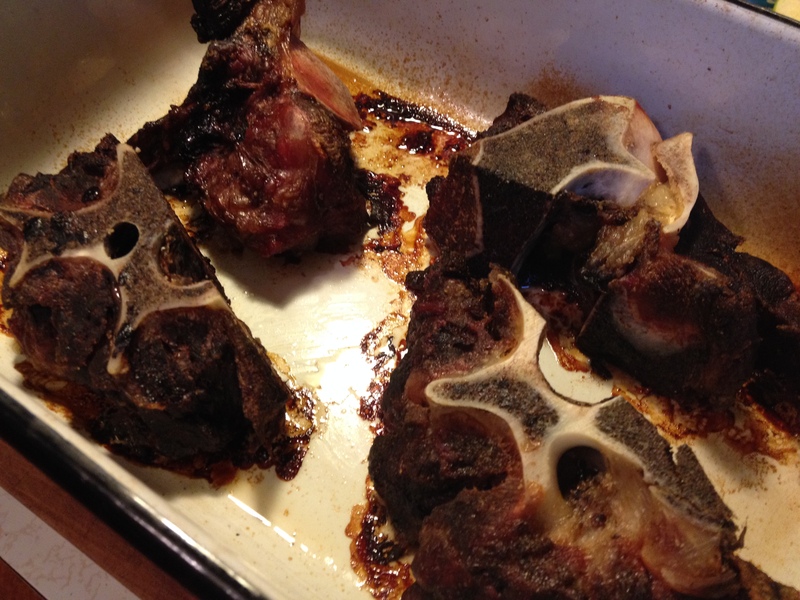 If there’s any salvageable meat left on the bones feel free to pick it off and add it back into the stock. 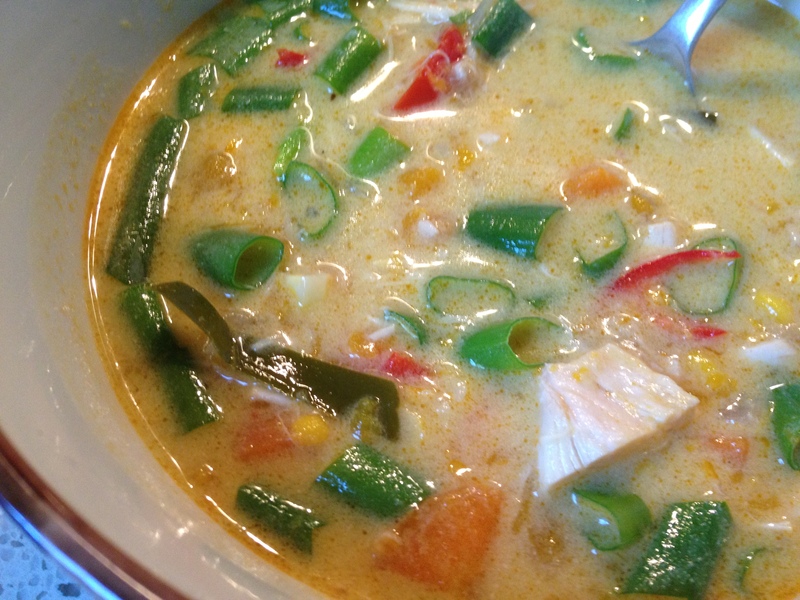 Thai Soup Ingredients: 1 x tablespoon of Thai red curry paste, 1 x can of coconut milk, 1 to 2 cups of diced pumpkin, 1 ear of fresh corn with the kernels removed, 1 cup of diced cooked chicken, 1 cup of fresh green beans chopped into one inch lengths, 2 green shallots chopped, 1 long red chilli sliced finely (remove the seeds if you don’t like it hot! 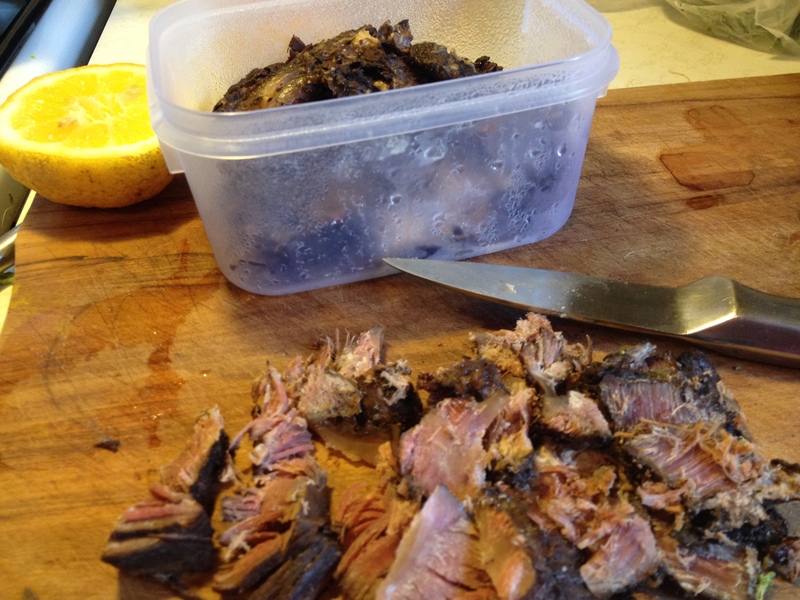 ), a dash of fish sauce or some sea salt, pinch of palm or raw sugar, 2 fresh double kafir lime leaves shredded finely. 1 extra lemon or lime cut into wedges to serve. 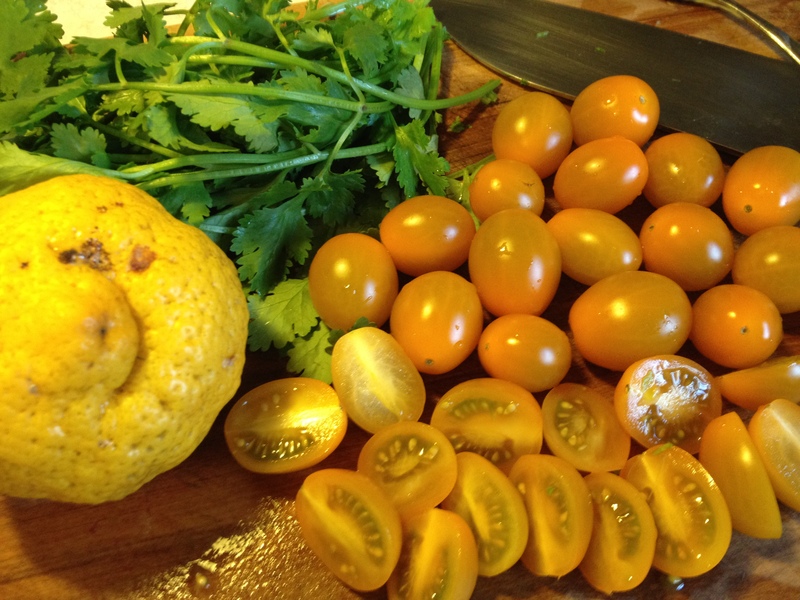 I have a kafir lime and a chilli bush in pots outside my kitchen door, the shallots grow like weeds in the vegie patch and the pumpkin is home grown too. Even if you only have a balcony, fresh herbs you can pluck as you need them is a simple but wonderful luxury. 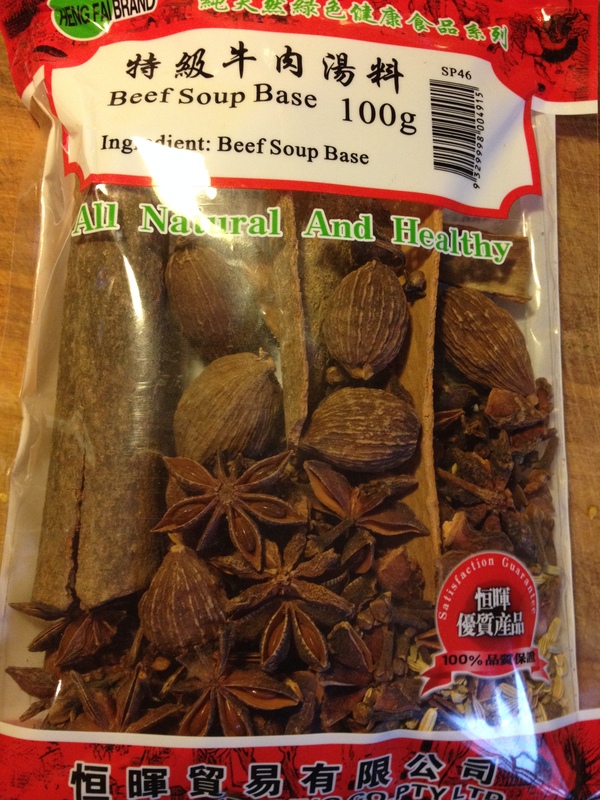 Method: Add your Thai curry paste into the hot stock and stir until it’s aromatic. 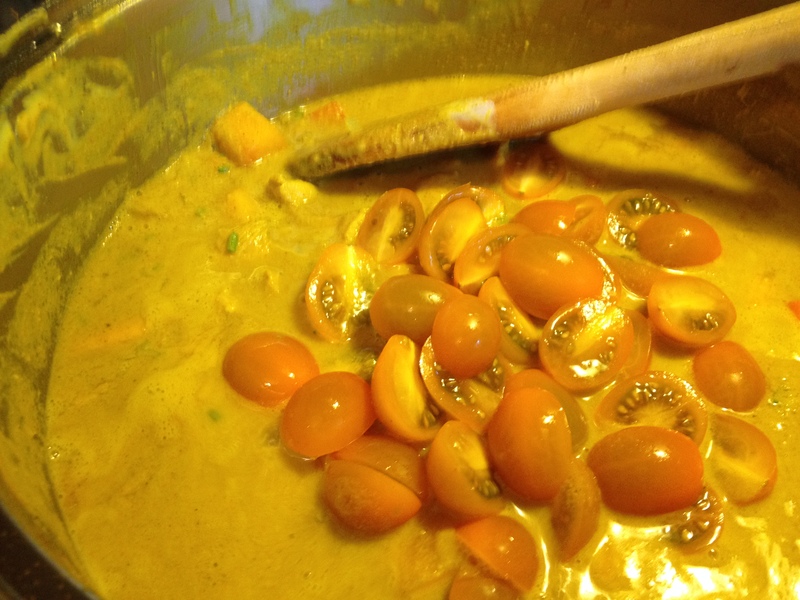 Then dump in the coconut milk and pumpkin. Simmer for eight to ten minutes until pumpkin is soft. Now add in in the chicken, green beans, corn, kafir lime and half the chilli. Heat for another two minutes and test your beans – they should be cooked but not soggy. Add a dash of fish sauce or a good grind of salt, and your pinch of sugar. Taste and adjust as necessary. Ladle into bowls and add a handful of the green shallots and chilli. Squeeze some lime over the top and enjoy! 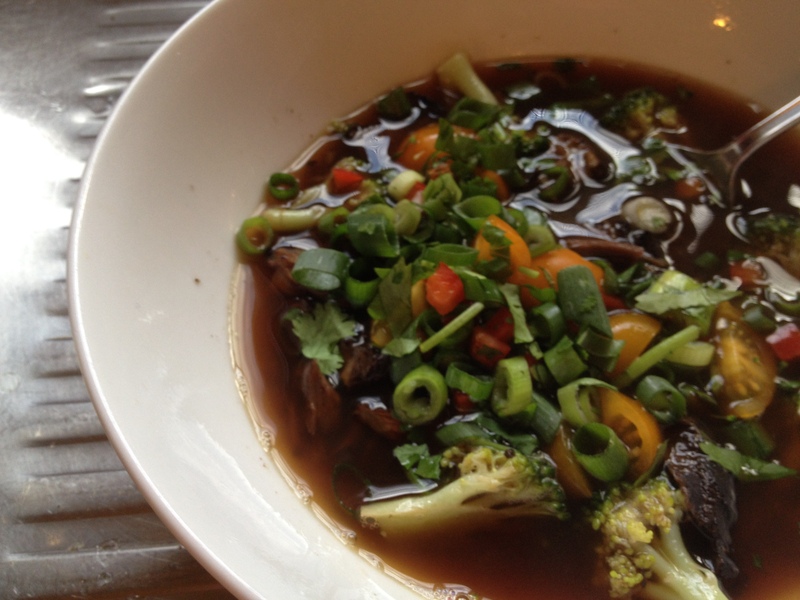 What can be better than comfort in a bowl? Miso soup variations are one of my favourite go-to’s when I am tired, sick, time poor, or stumped for inspiration. Feel free to play around with this simple recipe, using whatever you have to hand. 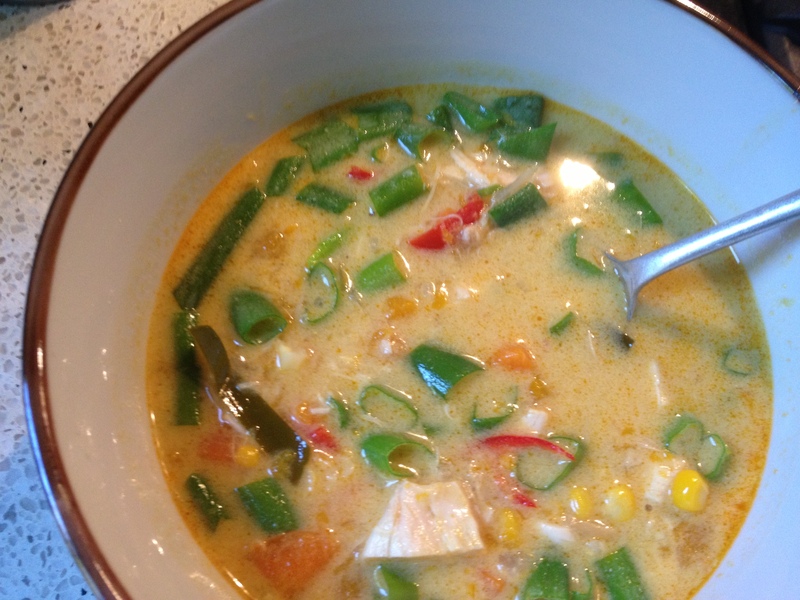 This is a very nurturing, easy-to-make soup and it is packed with goodness. 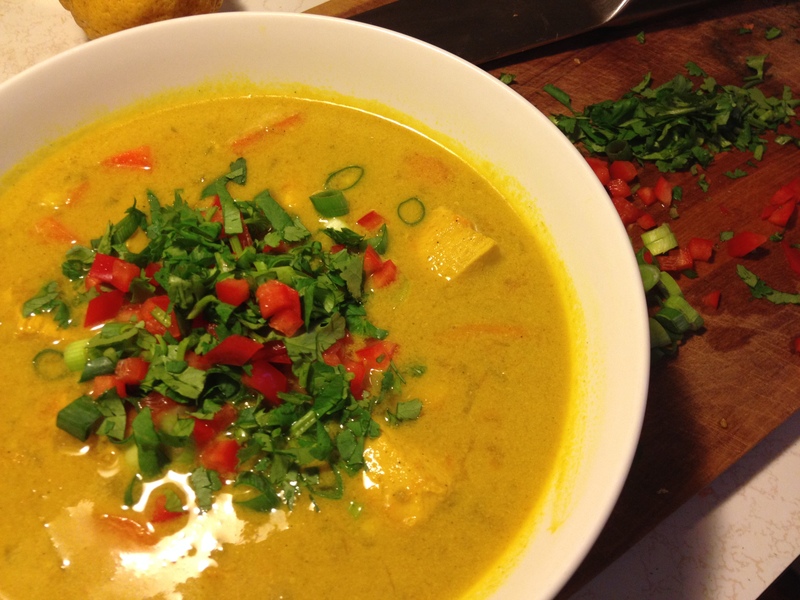 *For Vegans and Vegetarians omit prawns and use tofu, and a good vegetable stock. 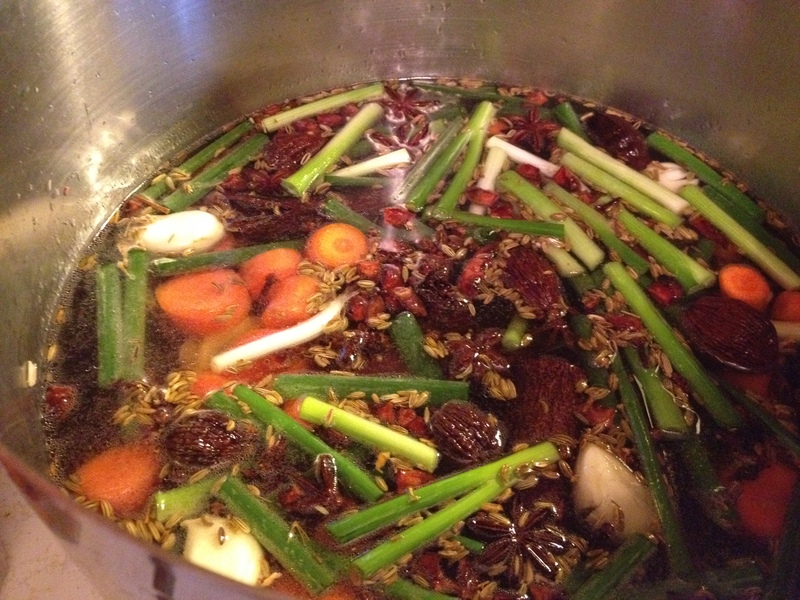 Bring your stock to the boil, or use boiling water and add in stock powders, dashi and bonito. 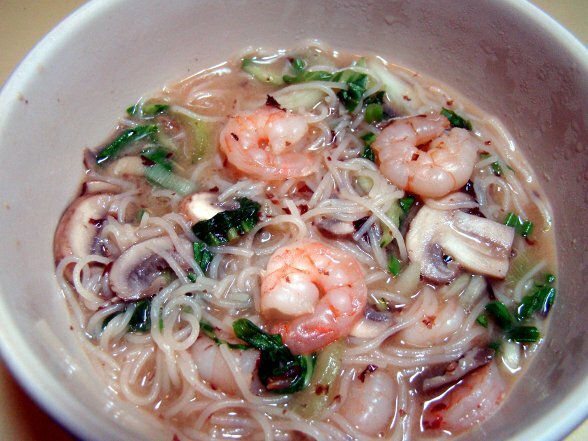 Add in the mushrooms and soba or rice noodles. 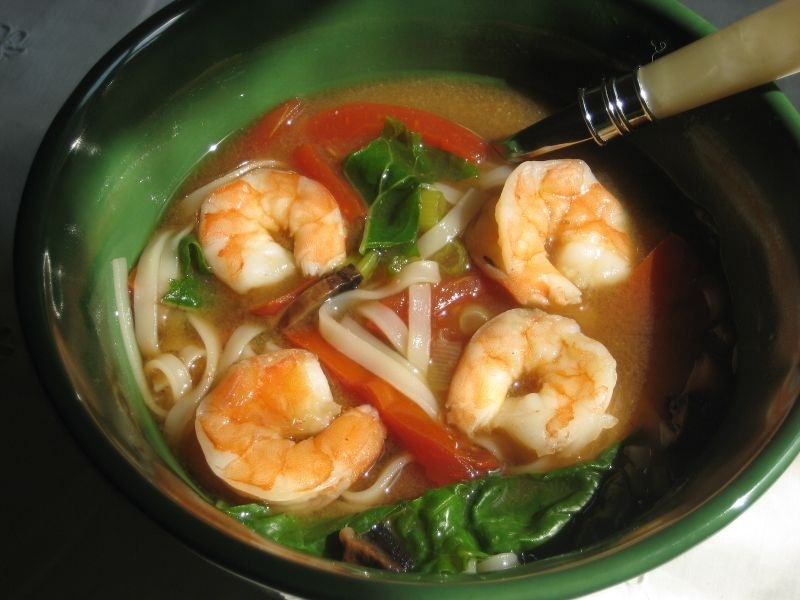 After a minute add the peeled, deveined prawns (or tofu) and tomato. Cook a few minutes until prawns change colour and turn pretty pink. 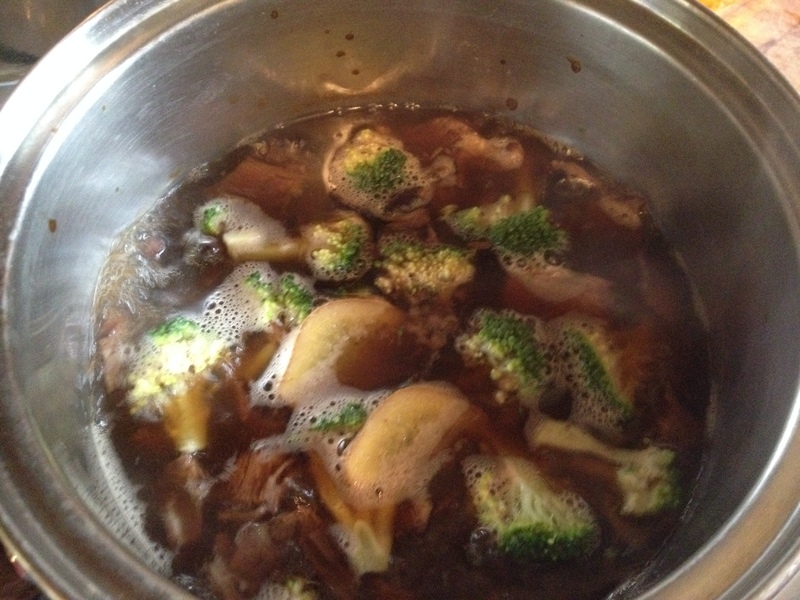 Finally, add in miso paste mixed with a little warm water or stock, and all your greens. Stir and serve. 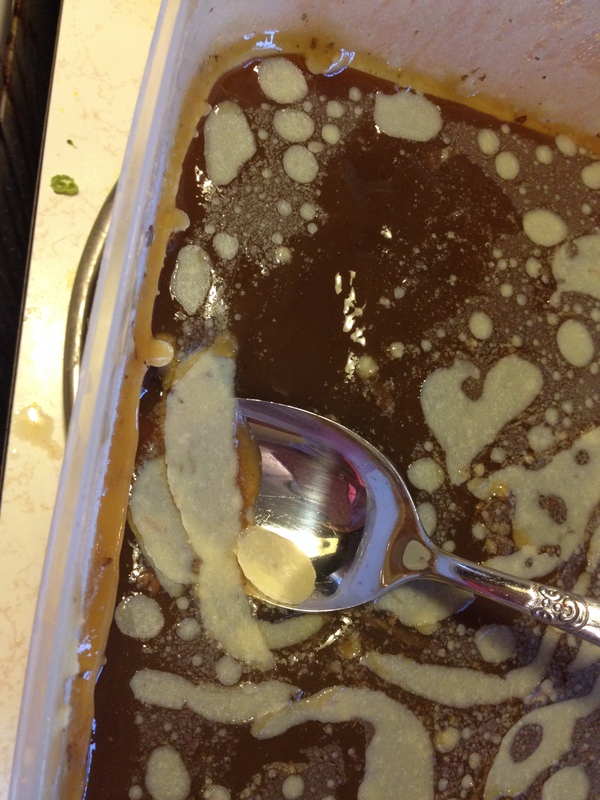 Note – do not boil miso or you will lose all the good bacteria.